They’ve walked a mile — and then some — in another’s shoes. 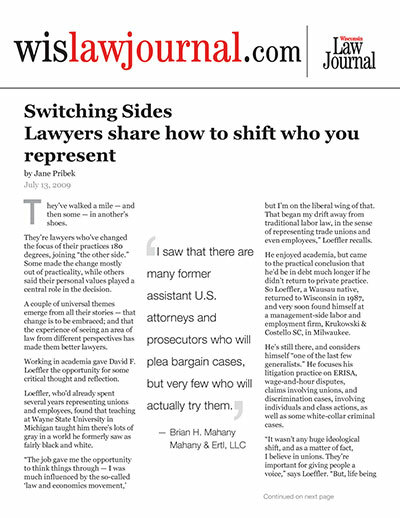 They’re lawyers who’ve changed the focus of their practices 180 degrees, joining “the other side.” Some made the change mostly out of practicality, while others said their personal values played a central role in the decision. A couple of universal themes emerge from all their stories — that change is to be embraced; and that the experience of seeing an area of law from different perspectives has made them better lawyers. Working in academia gave David F. Loeffler the opportunity for some critical thought and reflection. Loeffler, who’d already spent several years representing unions and employees, found that teaching at Wayne State University in Michigan taught him there’s lots of gray in a world he formerly saw as fairly black and white. “The job gave me the opportunity to think things through — I was much influenced by the so-called ‘law and economics movement,’ but I’m on the liberal wing of that. That began my drift away from traditional labor law, in the sense of representing trade unions and even employees,” Loeffler recalls. He enjoyed academia, but came to the practical conclusion that he’d be in debt much longer if he didn’t return to private practice. So Loeffler, a Wausau native, returned to Wisconsin in 1987, and very soon found himself at a management-side labor and employment firm, Krukowski & Costello SC, in Milwaukee. He’s still there, and considers himself “one of the last few generalists.” He focuses his litigation practice on ERISA, wage-and-hour disputes, claims involving unions, and discrimination cases, involving individuals and class actions, as well as some white-collar criminal cases. A few of his former colleagues, either co-workers or lawyers doing plaintiffs’ work exclusively, raised eyebrows at the mention of his new job. That didn’t last long, nor did it faze him. “I had, and still have, a lot of friends who do employee and union work,” he says. Switching sides was mostly a matter of tackling a new challenge for Brian H. Mahany. He’d served for two years as an assistant attorney general, four years as a state prosecutor, and four years as Maine’s revenue commissioner. While in Maine, he’d also served as special assistant to the senate president on tax matters, as well as director of the enforcement division in tax. “I’d had the prosecutorial experience, plus the enforcement and policy-making and political experience. The only thing left to try was working on the defense side,” he says with a laugh. Mahany also identified a niche he could fill. “I saw that there are many former assistant U.S. attorneys and prosecutors who will plea bargain cases, but very few who will actually try them,” he says, noting he’s had many opportunities to try cases in the past couple of years. Mahany tries high-stakes criminal and civil cases nationwide. At his prior firm, The Bernhoft Law Firm SC, Mahany was involved in representing Wesley Snipes in the actor’s 2008 Florida federal tax fraud and conspiracy case, where he was acquitted of all felony counts after a two-week jury trial. He says he relies heavily on his past experiences on the “other side,” to the benefit of his clients. There’s probably no better place for a new lawyer to gain valuable litigation experience than in insurance defense. Just ask Lynn R. Laufenberg, a past-president of the state’s organization for plaintiffs’ lawyers, the Wisconsin Association for Justice. Laufenberg came to Frisch Dudek & Slattery, a business and insurance-defense firm in Milwaukee, in 1977. “I, like most young lawyers, became a dumping ground for all the cases the more senior trial lawyers preferred not to have to deal with. But I was enthusiastic and didn’t know any better. I think I had my first jury trial some 30 days after starting at the firm,” he says. Laufenberg did insurance defense for the next half dozen years, he estimates, and was satisfied. Little by little, however, certain aspects of the practice started bothering him. He wasn’t wild about keeping track of his time. He also didn’t like reporting to mostly nonlawyer clients, some of whom were part of large bureaucracies and were mostly concerned with covering their backsides to their superiors, or who’d second-guess strategy decisions at inopportune times. Over time, his frustration grew. The transition started with subrogation work for insurers, which essentially involves helping plaintiffs’ lawyers build their cases. Over time, some of those plaintiffs’ lawyers began referring cases to him and others at his firm. Eventually, he found he had to make a choice, and in 1988 he opted to join a plaintiffs’ firm. Jeffrey S. Hynes’ career took off quickly after his law school graduation, first at the National Labor Relations Board, then at a cushy associate position at a prestigious management-side employment firm in Washington D.C. He was making a lucrative salary, had a caseload of challenging, interesting matters, and had lots of staff to assist him and mentors from whom to learn. Hynes decided to switch to representing plaintiffs as a way of honoring the working-class values he’d been raised with in the late 1960s and 1970s in Buffalo, N.Y.
and law school. He was merely looking for leads on firms that might be hiring. There were unexpected bonuses that quickly came his way, such as full partnership in three years and the opportunity to have a life outside the office. He’s made a living that doesn’t equal what he’d likely be earning if he had stayed in D.C., but by Milwaukee standards, it is fine, he says. By the way, he kept the Dylan LPs.